Develop a habit of disciplined prayer for your business, impact, and faith — in 10 min/day. …all to help you build a prayer habit that sticks! If you’re a current or wannabe entrepreneur, freelancer, business owner, or side hustler who follows Jesus and wants to have a more disciplined prayer life, this challenge is for you. Why is the challenge so long (10 weeks/70 days)? 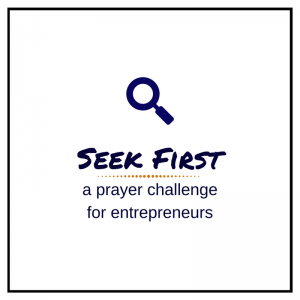 The Seek First entrepreneur prayer challenge is designed to build a daily prayer habit for your business, impact, and faith. A 2010 study showed it can take anywhere from 18-254 days to form a daily habit, but the average time required was 66 days (Lally, et al. Eur. J. Soc. Psychol. 40, 998–1009). The length of this challenge is based off that scientific finding for your success. I’ve started habits (prayer or others) but never stick with them. How is this going to be any different? You’ll have structure and support. The challenge includes weekly emails (with prompts, reflections, and resources), weekly mid-week email reminders, and a printable checklist to keep track of progress. If you run into a roadblock and think one-on-one support would be helpful, Shelly, the founder of Faith X, also offers coaching to help you clarify your situation and come up with a few action steps to move forward. This prayer challenge begins whenever you sign up.